Don’t fork or spade soil until it is dry enough for the clods to crumble when they fall. This time of year I recall my friend Erna Hermann and her weeding methods. First, she collects her garden wardrobe: long-sleeved shirt, pants, gloves, hat, socks and shoes. Second, she takes up her Warren hoe. When Erna left Romania at thirteen-years old, weeding had already settled deep into her bones. She’d learned how to till the earth with her father’s Warren hoe in his gardens and vineyards. After she married Wally and moved to Romeo, they planted vineyards and a vegetable garden. Orchards. Berry patches. Flowers. You name it, they grew it. Erna tilled their Romeo vineyard twice a year with her father’s hoe. The “entire” vineyard, she likes to emphasize. 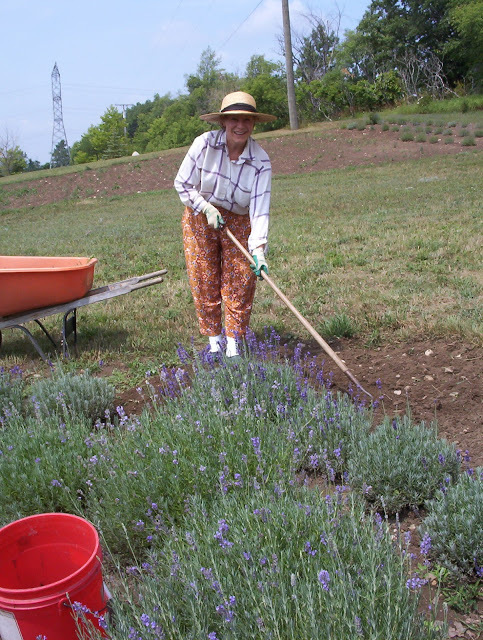 Now at seventy-something, there’s no thought of retiring her primary garden tool. Wally has the heart-shaped blade sharpened at the ready. “To me, Dad’s hoe is more versatile than any other. Maybe I prefer it because I’m left handed. This is the only spade I’ve ever used for the past fifty years,” Erna says. She compares the Warren hoe to the common grubbing or nursery hoe, curved blade of the cavex hoe, or the “action” variety with its push-and-pull feature, and finds them lacking in performance. Erna uses the sharp point to whack under the weed’s root to extract it from the soil. Then she drops the weed on the earth for the sun to dry out the roots. Unless the nuisance has gone to seed or rainfall is pending, she leaves it for natural compost. “In a small garden, you can gather weeds, but not in a large plot or vineyard. Turn the blade sideways to skim the soil for aeration and leveling,” Erna says. She also uses the spade’s point to dig furrows for planting and weeding between narrow rows. There’s no doubt about it. Erna’s Warren hoe is the star of her gardens, lifting weeds like they were sprouted in soft butter. All other tools are replaceable. Yes, I imagine Erna’s gathering her garden paraphernalia about now. She’s walking and watching her yards, the sky, and listening to the birds and weather forecast. Dear Reader, several mornings ago, I read Erna’s garden wisdom again in Richardson Wright’s The Gardener’s Bed-Book. Those two often agree when it comes to cultivation. I see my yellow-checkered long-sleeved blouse in my closet. I hear Erna hum with pleasure, her father’s Warren hoe striking the earth—sweet and fruitful music, an overture of praise for another growing season.